, | of honours. This was conferred by his parishioners of Stanwick, by whom he was so sincerely beloved, that on his falling ill at London of the sickness which proved fatal to him, they plowed and sowed his glebe lands at their own expence, that his widow might have the benefit of the crop which she accordingly received after his decease; an anecdote more felt and valued by his family than any thing that usually adorns the page of the biographer. John Dolben, afterwards archbishop, was educated at Westminster-school, where he was admitted a king’s scholar in 1636; and in 1640 was elected to Christ church, Oxford, where he was admitted, in the same year, a student on queen Elizabeth’s foundation. 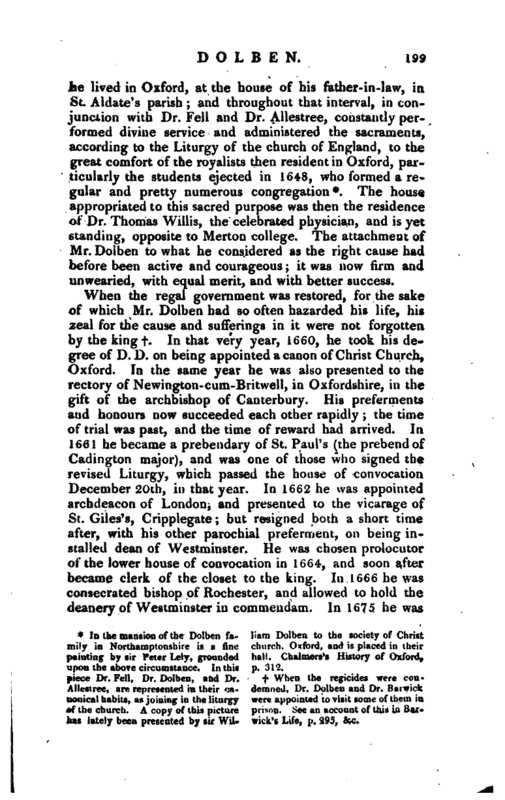 It has been thought worthy of remark, as a strong instance of hereditary attachment to those seminaries, that he was the second in order, of six succeeding generations, which have passed through the same steps of education, and it has been remarked that since his time, Westminster-school has rarely been without a Dolben. When the civil wars broke out, Mr. Dolben took arms for the royal cause in the garrison at Oxford, and served as an ensign in the unfortunate battle of Marston-Moor, in 1644, where he received a dangerous wound in the shoulder from a musquet-ball; but in the defence of York, soon after, he received a severer wound of the same kind in the thigh; which broke the bone, and confined him twelve months to his bed. In the course of his military service he was advanced to the rank of captain, and, according to Wood, of major. 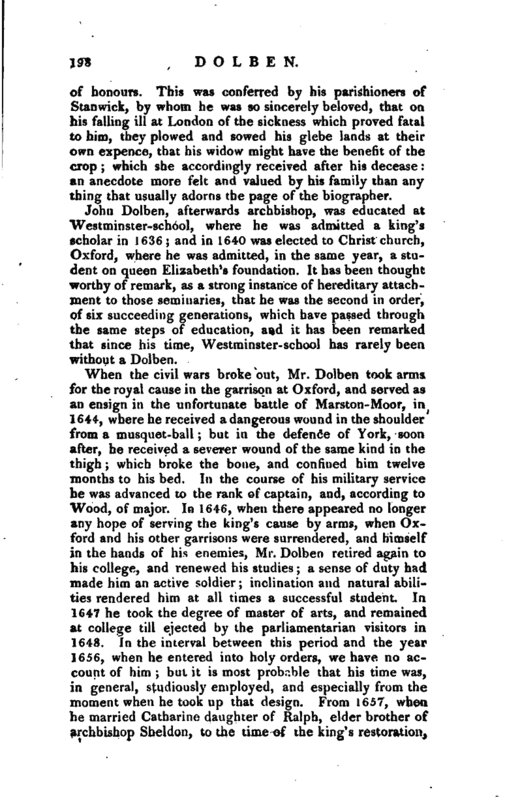 In 1646, when there appeared no longer any hope of serving the king’s cause by arms, when Oxford and his other garrisons were surrendered, and himself in the hands of his enemies, Mr. Dolben retired again to his college, and renewed his studies; a sense of duty had made him an active soldier; inclination and natural abilities rendered him at all times a successful student. In 1647 he took the degree of master of arts, and remained at college till ejected by the parliamentarian visitors in 1648. In the interval between this period and the year 1656, when he entered into holy orders, we have no account of him; but it is most probable that his time was, in general, studiously employed, and especially from the moment when he took up that design. 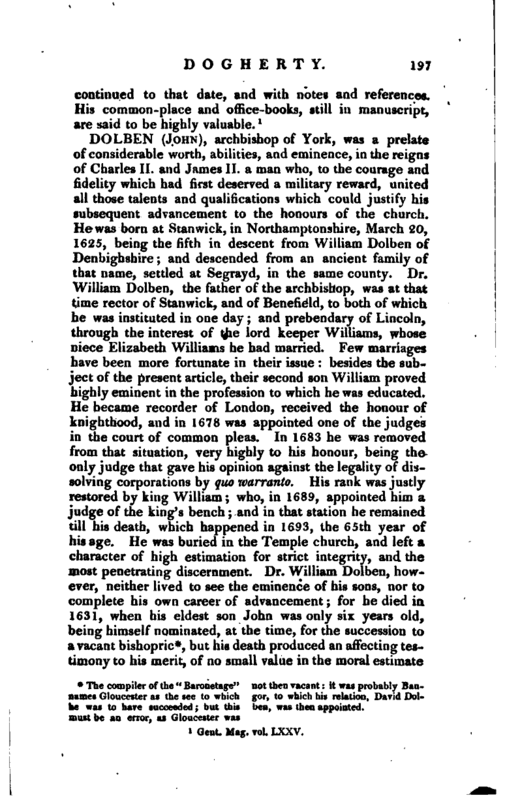 From 1657, when he married Catharine daughter of Ralph, elder brother of archbishop Sheldon, to the time of the king’s restoration, | he lived in Oxford, at the bouse of his father-in-law, in St. Aldate’s parish; and throughout that interval, in conjunction with Dr. Fell and Dr. Allestree, constantly performed divine service and administered the sacraments, according to the Liturgy of the church of England, to the great comfort of the royalists then resident in Oxford, particularly the students ejected in 1648, who formed a regular and pretty numerous congregation*. The house appropriated to this sacred purpose was then the residence of Dr. Thomas Willis, the celebrated physician, and is yet standing, opposite to Merton college. The attachment of Mr. Dolben to what he considered as the right cause had before been active and courageous; it was now firm and unwearied, with equal merit, and with better success. upon the abo?e circumstance. In this p. 312.
piece Dr. Fell, Dr. Dolben, and Dr. f When the regicides were conAllestree, are represented in thrir <;a- deinned, Dr. Dolbeu and Dr. Barwiek uouical habits, as joining in the liturgy were appointed to visit some of them in of the church. A copy of this picture pn-s->n.See an account of this in Barlias lately been presented by sir WiU wick’s Life, p< l iy;>, &c. | appointed lord high almoner; an office, says Wood, which he discharged with such justice and integrity as was for the great benefit of the poor. It would betray great ignorance of the ways of courts to suppose, that in all these steps he was not in part indebted to the interference and interest of archbishop Sheldon; yet where merit is conspicuous, the effect of patronage is greatly facilitated, which appears to have been the case in the instance now before us. 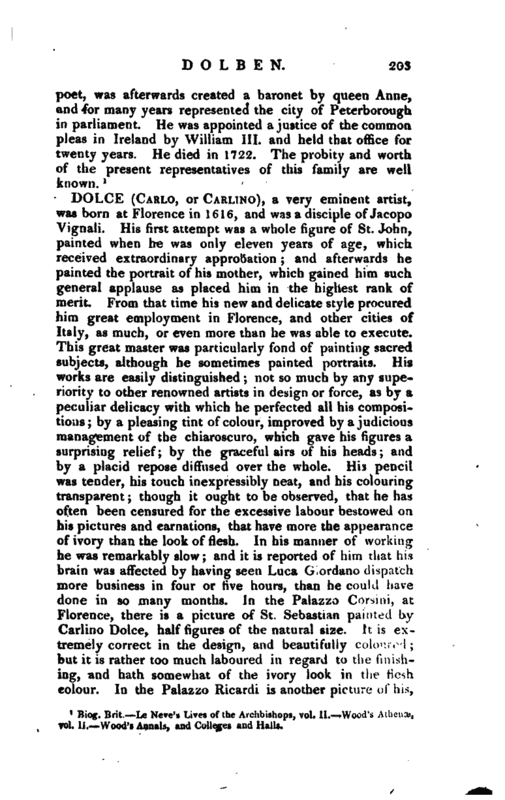 Translation to the see of York was the final gradation of his honours, and enjoyed only for a short time, as between the last advancement and his death something less than three years intervened. He was translated to York in August 1683*, and then became, by an unusual transition, the ecclesiastical governor of that place which he had formerly assisted in defending by military force. 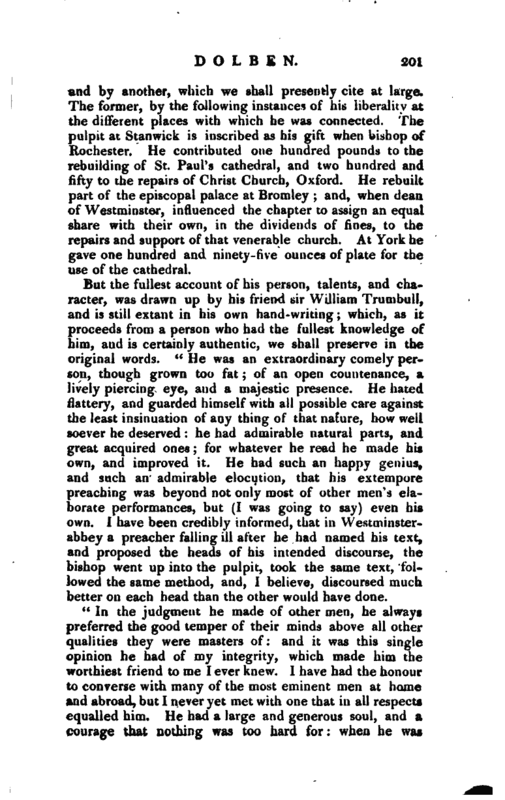 His activity was not yet exhausted, though exerted in a different way; he diligently contributed to the good administration of the service in his cathedral, and in 1685 made a new regulation of archbishop Grindal’s order of preachers, and appointed a weekly celebration of the holy sacrament: and was, in all respects, as his epitaph expresses it, an example both to the flock and to the pastors under him. The death of archbishop Dolben was occasioned, not by natural decay, but by criminal neglect. At an inn on the North road he was suffered by the proprietors to sleep in a room where the infection of the small-pox remained; he there caught the disorder, which being of a virulent kind, and attended with lethargy, put an end to his life at Bishopthorp, on the 11th of April 1686, in the sixty-second year of his age, after a confinement to his bed of only four days. 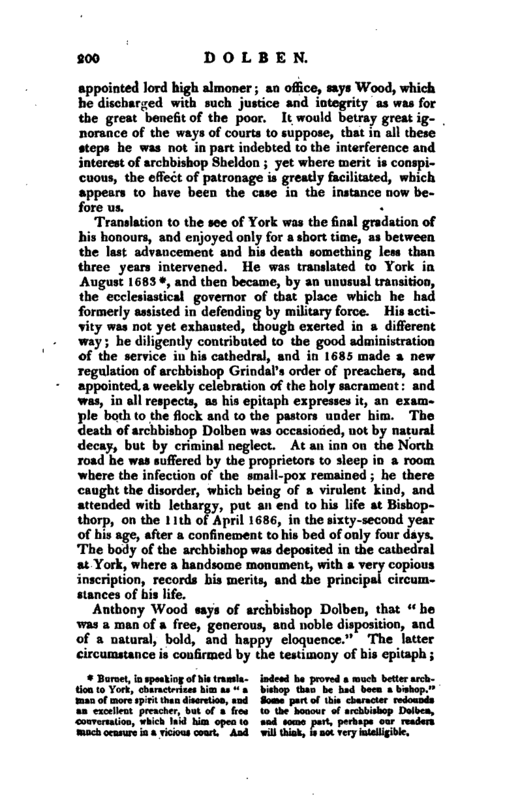 The body of the archbishop was deposited in the cathedral at York, where a handsome monument, with a very copious inscription, records his merits, and the principal circumstances of his life. Burnet, in speaking of his translation to York, characterizes him as “a man of more spirit than discretion, and an excellent preacher, but of a free conversation, which laid him open to much censure in a vicious court. And indeed he proved a much better archbishop than he had been a bishop.” Some part of this character redounds to the honour of archbishop Dolben, and some part, perhaps our readers will think, is not rery intelligible. | and by another, which we shall presently cite at large. The former, by the following instances of his liberality at the different places with which he was connected. The pulpit at Stanwick is inscribed as his gift when bishop of Rochester. He contributed one hundred pounds to the rebuilding of St. Paul’s cathedral, and two hundred and fifty to the repairs of Christ Church, Oxford. He rebuilt part of the episcopal palace at Bromley; and, when dean of Westminster, influenced the chapter to assign an equal share with their own, in the dividends of fines, to the repairs and support of that venerable church. At York he gave one hundred and ninety-five ounces of plate for the use of the cathedral. 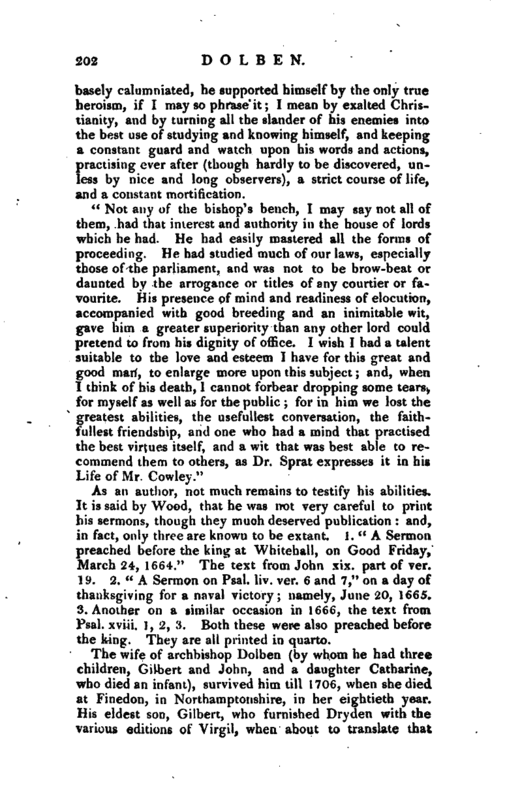 But the fullest account of his person, talents, and character, was drawn up by his friend sir William Trumbull, and is still extant in his own hand-writing; which, as it proceeds from a person who had the fullest knowledge of him, and is certainly authentic, we shall preserve in the original words. " He was an extraordinary comely person, though grown too fat; of an open countenance, a lively piercing eye, and a majestic presence. He hated flattery, and guarded himself with all possible care against the least insinuation of any thing of that nature, how well soever he deserved: he had admirable natural parts, and great acquired ones; for whatever he read he made his own, and improved it. He had such an happy genius, and such an admirable elocution, that his extempore preaching was beyond not only most of other men’s elaborate performances, but (I was going to say) even his own. I have been credibly informed, that in Westminsterabbey a preacher falling ill after he had named his text, and proposed the heads of his intended discourse, the bishop went up into the pulpit, took the same text, followed the same method, and, I believe, discoursed much better on each head than the other would have done. "In the judgment he made of other men, he always preferred the good temper of their minds above all other qualities they were masters of: and it was this single opinion he had of my integrity, which made him the worthiest friend to me I ever knew. 1 have had the honour to converse with many of the most eminent men at home and abroad, but I never yet met with one that in all respects equalled him. He bad a large and generous soul, and a courage that nothing was too hard for: when he was | basely calumniated, he supported himself by the only true heroism, if I may so phrase it; I mean by exalted Christianity, and by turning all the slander of his enemies into the best use of studying and knowing himself, and keeping a constant guard and watch upon his words and actions, practising ever after (though hardly to be discovered, unless by nice and long observers), a strict course of life, and a constant mortification. As an author, not much remains to testify his abilities. It is said by Wood, that he was not very careful to print his sermons, though they much deserved publication: and, in fact, only three are known to be extant. 1. “A Sermon preached before the king at Whitehall, on Good Friday, March 24, 1664.” The text from John xix. part of ver. 19. 2. “A Sermon on Psal. liv. ver. 6 and 7,” on a day of thanksgiving for a naval victory; namely, June 20, 1665. 3. Another on a similar occasion in 1666, the text from Psal. xviii. 1, 2, 3. Both these were also preached before the king. They are all printed in quarto. Biog. Brit. Le Neve’s Lives of the Archbishops, vol. II. Wood’s Athenae, vol. II, Wood’s Annals, and Colleges and Halls.